Backpacks, lunches, breakfast, toothbrushes, hair brushes, carpool, bus stops, homework, after school activities, and on and on. Back in May my Pinterest feed was FILLED with ideas for setting up summer routines and schedules to make sure kids were getting time outside, reading time, activities, and limited screen time. I had to have seen at least two dozen different versions in a matter of a week. But what about school year routines? As much as I love a good routine, I'm fairly lax in the summer. My kids know the basics: 30 minutes of screen time (no video games) each and additional screen time (including video games) can only be earned by doing extra chores. Lunch is mid day, snacks at 10 and after nap/quiet time, go outside as long as it's not rainy or a heat advisory, and clean up your messes. I don't plan daily themes and don't do elaborate activities. Summer for us means relaxing and enjoying our time together, not following a set plan. The school year is different. 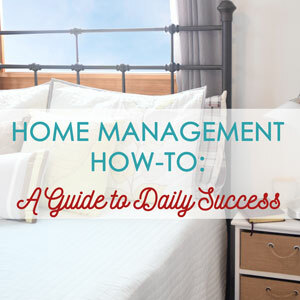 In order to keep the house running smoothly and for everyone to not lose their minds with things that need to get done each day, we have simple routines put in place. All the kids know them (even if they need reminders on occasion) and they have taught our kids a good deal of responsibility because they know mom and dad are not going to be doing it for them! Our bedtime routine + how to create your own! Our routines really go in a cycle and all of them help the others happen, so it's hard to pick a starting point. I believe a good morning starts the night before so let's start the night before school so your first day (and the days after) begin on the right foot! Packing a lunch for school is so incredibly easy and really only takes a couple minutes. We've taught our kids how to do it themselves by using a simple list. Get it packed either right after school or at the minimum, before bed, and it's one less thing to do in the morning. Make sure you include any snacks needed for the day and a water bottle to keep those bodies hydrated! Don't need to pack lunch? How about making sure the lunch account has money in it? Getting a note home from the teacher for low funds is never a good feeling. Most days for homework our kids are supposed to read for 20 minutes. We've built this into their daily routine by sending them to their rooms after getting home from school and having a snack. It gives them a chance to unwind after a busy day of learning and occasionally they fall asleep - clearly they needed the rest! As the kids get further into school they may come home with worksheets or other homework that needs to be completed. Our homework time falls after lunch making and quiet reading and before extra play time or screen time. The kids need to sit at the dining room table where we have extra school supplies nearby. Find a time in your afternoon/evening when the kids can work on homework without too many distractions and enough writing utensils. I usually did mine in my bedroom with my TV on (probably not the best idea!) but with my giant drawer of pens, pencils, and markers. Finding a time that fits into your after school life might prove to be a bit of a challenge, especially for working parents, but see what you can do. Maybe they can sit at the table while you are making dinner. Do they attend an after school program where they can do homework? Maybe use the time between dinner and bed to knock out the work and use any remaining time for relaxing. This routine is the one that we probably have the biggest issue with because kids are kids. Even after years of the same routine we are still reminding them. I feel like there is no greater frustration on a school morning than a kid that can't find a belonging that has a designated home. Shoes, backpacks, homework, jacket, etc are all misplaced at various times and I can hear the voice screaming in my head, "If you had put it away where it belongs we wouldn't be having this issue!" We have a small front closet for seven people so there was no way we were going to fit all the kids school belongings in there as well as everyone else's regular items. Instead we gave the kids hooks for their coats and bags in their rooms. Our big boys have an over the door hook and our daughter uses a 3M Command hook. Make sure if you go this route you get one for each item (bag and coat) because we started the boys out with 3M Command hooks and even with an appropriate weight we still had breakage issues because they would pull everything off at once rather than lift it gently. Shoes, mittens, and hats are all in their cubbies in the closet. Boots are on the boot tray during the winter. Homework should get put back in backpacks immediately after completion. Mama does not want to load up the little kids to bring you your math sheet. You will take a late grade and learn a lesson! This routine is nothing new for most parents, but being diligent in those first few weeks to take a minute and walk through right before bed and say, "Show me your homework. Where is your jacket? Do you know where your water bottle is?" will hopefully help alleviate the issues in the morning. What a surprise, I'm including meal planning! ;) This routine actually falls on me, but it helps the kids as well because they know what to expect each morning for food. Monday is breakfast burrito bowls - eggs, sausage, cheese, hashbrowns (sweet or regular), sour cream, and salsa. Yum! Tuesday rotates between waffles, pancakes, and french toast. I prefer to make sheet pan pancakes because then I'm not flipping pancakes when they are ready to eat. I usually make large batches of waffles and keep them in the freezer and I often do baked french toast for school days also because of the flipping! Wednesday is oatmeal - either regular or baked. Thursday is another egg dish, often baked omelettes or egg sandwiches. Friday is a quick bread and scrambled eggs. Because I don't work outside the home, this plan works for us. If you are in a hurry to get out the door you might need to plan something like yogurt and granola, smoothies, bagels, toast, or baggies of cereal. The point is to have a plan so your kids aren't asking what's for breakfast and you are trying to apply mascara, search the fridge, and pack a bag. While my kids style is something I leave up to them (for the most part), I absolutely insist they have their hair and teeth brushed before leaving the house. The kids are allowed to the kitchen at 7:15 and I try to have breakfast on the table no later than 7:30. Between the time they get upstairs and breakfast ready they need to get their hair brushed and (for the older boys) put deodorant on. This year will be a little different because our daughter is starting kindergarten! She can mostly brush her hair but she can't put in any ponies so we will both be adjusting to a new routine! After breakfast everyone gets their teeth brushed before heading out the door so they start their school day minty fresh ;) We even use our Google Home Mini to set two minute timers so everyone is brushing for the correct amount of time. What can you do to make sure your children's hygiene needs are addressed before leaving the house? If you are eating on the run, perhaps they need to brush before getting in the car. Can you work on teaching your daughter simple hair styles she can do on her own - even headbands or simple barrettes are possible for most children. I don't care if my kids are two or ten, we have a bedtime routine and it starts at the same time for every child. It doesn't mean they need to fall asleep immediately, but it helps everyone switch from the daily fun to to a calmer state. Or at least in my mind it does! The kids jumping on their beds in the next room might disagree. Our bedtime routine is fairly simple, and hasn't changed much since I shared about it two years ago. These days it starts later, but all the basic components are still there. We've added showers for the big boys on a daily basis (or at least every other for the second born) and all the kids get to be awake for the whole routine since the little guys are now three versus one! If you want to start a simple bedtime routine, pick three tasks that you can implement to start. Maybe pjs, brush teeth, and bedtime story with snuggles, Or once they are a bit older you can save the pj part for on their own time and have the kids take turns reading aloud, doing a family devotional, or praying for each other. We send all the kids to their rooms by 8pm and the little boys usually fall asleep fairly quickly. We allow the older three to read until closer to 9pm but rarely do any of them make it that long! And once the school year is in full gear I'm sure they will be falling asleep much sooner. Having a plan in place doesn't mean all the chaos is completely eliminated - I wouldn't have much to write about if it was all gone from our lives! - but it's certainly more controlled. These help keep our home functioning in a much more manageable way when the school year arrives. What routines do you have in place to help your school days run smoothly? 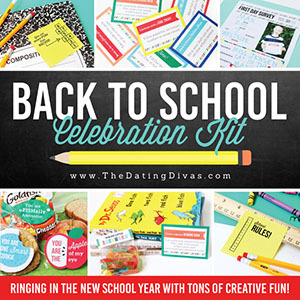 After you've gotten the routines figured out, get the kids excited for school by using this absolutely adorable Back to School Celebration Kit from The Dating Divas! I love the idea of a first day of school memory survey! Those first days are filled with so many new things and incredible memories that they should be saved as something special! And you can sneak the notes in your kids lunches - after they've packed them all by themselves! The 2018 Ultimate Homemaking Bundle is LIVE!